I use VortexBox as my home music server. 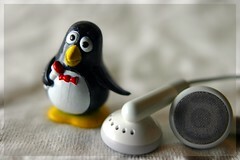 It's a great all-in-one music server, being the lynchpin of my home music network. And so, when VortexBox 2.3 was released, installing it went right to the top of my to-do list! I operate a slightly different setup to other people. 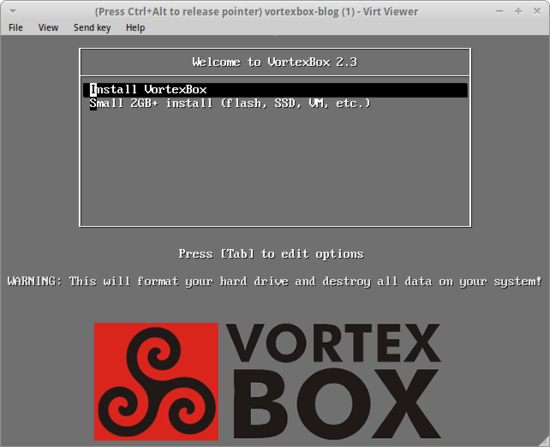 Most people dedicate VortexBox to its own physical server. In my case, I have multiple different similar services to provide: file serving, TV recording and serving and a file backup server. To avoid having multiple physical servers I adopt a practice called virtualisation to consolidate all of my different servers onto one physical server. The particular software I use for virtualisation is KVM. I use this because all of the servers in my network are Linux based, and the packaging and toolset are ideal for use from a physical Linux server "host" machine. VortexBox 2.3 installs are recommended to be done as a fresh new install to a computer, not an upgrade (although some people are working on that!). This means I needed to create a new KVM virtual machine. But before I did that, I downloaded the CD image from the VortexBox download page and saved the image in a location accessible by the KVM host. The guest OS that is being installed. The size of the storage, 35 gigabytes, was chosen on the advice of the VortexBox forum. The guest OS of fedora16 was the latest version of Fedora offered. I guess this is because I'm using an old version of virt tools. Ideally, fedora20 would be used, as that's VortexBox 2.3's underlying operating system. Still, it worked. Here's where I made my first false start. I chose the default Install VortexBox option. This hit a brick wall a few screens later where the install would hang with no feedback. If you're installing VortexBox 2.3 in a VM, use the Small 2GB+ install (you know, the one that actually says it's for VMs...). For the Google searchers, that's specified nonexistent disk sda in ignoredisk command. Before, I was unwittingly using the deprecated -f and -c switches. --disk gives greater control and allows the bus type to be specified. By specifying scsi this sets the bus type to SCSI and therefore the drive is named /dev/sda, allowing the installation to proceed. From there it was plain sailing! I noticed that SSH access was granted before the install was complete. Visiting the VortexBox web page at this point shows a message to the effect that the installation is ongoing. It's also possible to watch the progress by keeping an eye on the /var/loy/syslog file. Thanks to LaserGuided for the image above.